InM has organised a seminar on Micro Credit and the Rural Labour Market in Bangladesh. The programme was held on July 8, 2015 at 11.00 am in Media Bazar, Bangabandhu International Conference Centre (BICC), Agargaon, Dhaka. Professor M. A. Baqui Khalily, Executive Director, InM welcomed every one and delivered his welcome speech. Dr. Qazi Kholiquzzaman Ahmad, Chairman, presided over the session. 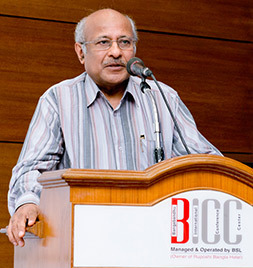 Professor S. R. Osmani, Professor of Development Economics, Ulster University, UK, presented the keynote paper. Dr. Mahbub Hossain, Distinguished Professor, BRAC University, Dr. Rizwanul Islam, Former Special Advisor on Growth, Employment and Poverty Reduction, ILO, Dr. Rushidan Islam Rahman, Research Director, BIDS , Dr. Selim Raihan, Professor, Department of Economics, University of Dhaka and Dr. Sajjad Zohir, Executive Director, Economic Research Group (ERG) were present as panel discussants. This study has tried to assess the impact of microcredit on the rural labour market in Bangladesh using data from a nationally representative large-scale survey. Two aspects of the impact on labour market were investigated – viz. employment at the household level and wage rate at the village level. While assessing the impact on employment, the study looked at both total employment and pattern of employment (i.e., sector and mode of employment) of borrowers, and disaggregated the employment impact by gender and by ‘productive’ and ‘non-productive’ users of microcredit. In addition, the paper also considered the possible spill-over effect on non-borrowers. The study found that microcredit has a strong positive effect on the employment level of the members of borrowing households. An average household gains 53 person days of employment in a year as a result of access to employment, which amounts to about 19 per cent increase from the employment level that would obtain without microcredit. Female employment increases proportionately more than male employment – 29 per cent for females as against 17 per cent for males. The extent of employment effect differs depending on the use of microcredit. As expected, households that use loans mainly for productive purposes gain more employment compared to the households who use their loans mainly in unproductive ways. It is important to note, however, that even the latter category of households gains substantial amount of employment – 41 person days a year per household as against 63 persondays for productive users of loans. The study could not find any significant spill-over effect of microcredit on non-borrowers – either negative or positive. This implies, on the one hand, that the increase in employment enjoyed by microcredit borrowers represents a net addition to rural employment – it did not come at the expense of non-borrowers. On the other hand, this finding also implies that any additional demand for wage labour generated by the microenterprises run by microcredit borrowers is still not significant enough to be visible at the macro level. Apart from raising employment at the household level, microcredit also exerts a significant positive effect on the wages rate at the village level; a 10 per cent increase in the spread of microcredit in a village would raise the wage rate by 4.6 per cent. Dr. Selim Raihan, Professor, Department of Economics, University of Dhaka, appreciated the technically sound paper by Professor Osmani. He commented that more descriptive data on breakdown of non-borrowing group will further improve the paper. He pointed out that it would be interesting to find out the returns on capital from self-employment. Dr. Raihan added that panel data would enrich the analysis. In his speech, Dr. Sajjad Zohir, Executive Director, Economic Research Group (ERG) remarked that it is important to look into borrowing habits of the households and individuals. He said that it is also vital to look into characteristics of the household members e.g. if they are residing here or working abroad. 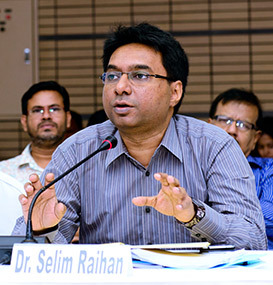 Dr. Rushidan Islam Rahman, Research Director, BIDS, emphasised on the policy implications of the paper. She stated that in order to improve the quality of microfinance institutions, it is important to compare the performance of MFIs in regards to different aspects including employment. She appreciated the well written and quality paper, but thinks that it would help for policy implication if employment is also measured in terms of returns and benefits from it. 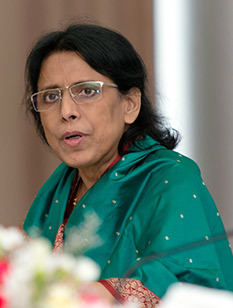 In her remarks, Dr. Rahman pointed out that an increase in 8 days employment for women is not enough, and it should rather serve as a warning bell. Moreover, it is important to investigate the proportion of youth in newly generated employments and impact of microcredit on indicators such as productivity, women empowerment and so on. 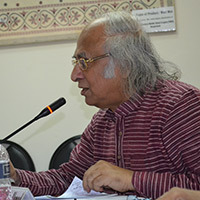 Dr. Rizwanul Islam, Former Adviser on Growth, Employment and Poverty Reduction, ILO, regard this study as an important conjunction as no that many studies have been conducted on this topic in last two decades. He highlighted that extent of productivity has not been emphasised in this study, and perhaps production function approach should also be used. He said, even though the study shows that more women take loans but question remains who are using this loan. Dr. Islam concluded his speech with a suggestion to further disaggregate non-agriculture employments and study the impact of microcredit. Dr. Mahabub Hossain, Distinguished Professor, BRAC University, commended the paper for showing an important impact of microcredit. However, he suggested that besides measuring number of employed days, perhaps earnings would yield in interesting findings. He remarked whether increase in employment days can be fully attributed to microcredit due to dynamic effect of factors such as improvement in infrastructure, technological advancement and so on. Hence, it is important to consider these aspects as well. Dr. Qazi Kholiquzzaman Ahmad said microcredit is not only microcredit these days. It has changed its course. It is now known as ‘integrated credit’. Only credit cannot be the solution for poverty eradication Along with credit health, education, training and relevant matters are required to provide. PKSF along with its partner organisations are already implementing it and to see the high side of it days are not very far.